One of Rich Rodriguez's favorite plays out of the classic 2x1 shot gun spread offense is the read lead run play to the open or 'weak' side of the set. 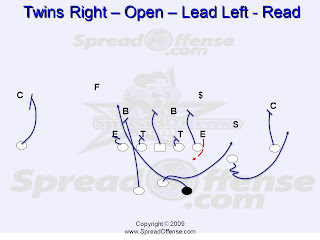 As a result of the formation and Coach Rod's preference, this play is often run to the short side of the field or the boundary. I found a great video of this specific play from last years Michigan vs Purdue game. I know when Coach Rod was at West Virginia, he and Calvin Magee (Offensive Coordinator) loved running this play with Pat White, Steve Slaton, and Owen Schmitt. Below is the play diagram for your reference. You'll see this is your classic outside zone blocking play, but what makes this play tough to defend a lot of times is the defense over defending to the 'field' and/or strength of the formation. As a coaching point, it's important to stress to your quarterback (especially if he's a dual threat QB who can run well) that he still needs to read that backside end and if that end knifes down or collapses hard on the zone lead he should keep it and progress to the strong side of the formation where he has the #2 receiver running a bubble screen or pitch option.